Directly across the street from Barefoot Landing is one of the most amazing resorts on the Grand Strand - Ocean Creek Resort. 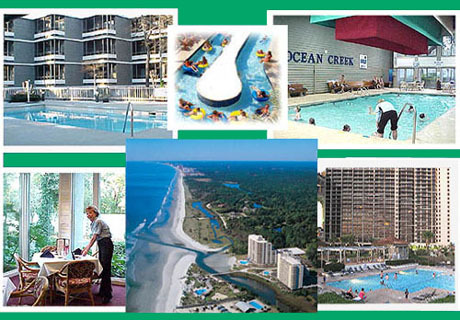 Ocean Creek consists of 57 acres of condos and villas in every price range and type. From oceanfront to rustic cabin lodging, you'll find it all, and in the middle of a lushly landscaped, gorgeous compound with lakes, ponds, and channels everywhere. You'll find tennis courts, fitness facilities, general stores, restaurants, golf cart rentals, and private beach cabanas for the owners and guests. 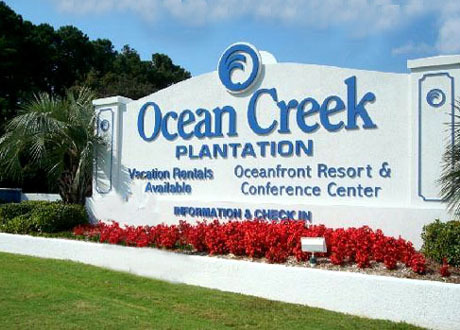 Come to Ocean Creek Resort and you may not have to leave it unless it's just to visit some of the local attractions or have something new for dinner. You're a golf cart ride away from Barefoot Landing and all the restaurants, boutiques, live shows and entertainment. Next door to the entrance of Ocean Creek is the Cracker Barrel restaurant, which may have the best breakfast in the country. The Myrtle Beach Mall is a 3-minute drive south, as is a Super Walmart. 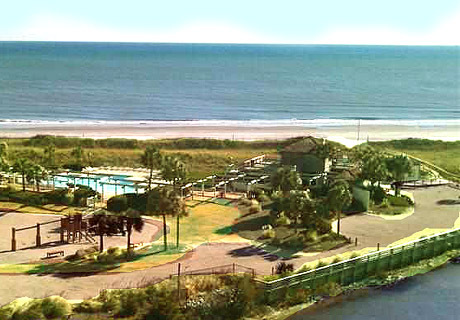 It's the ideal location for everything that North Myrtle Beach, and Myrtle Beach has to offer. 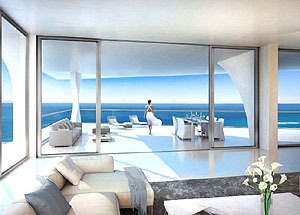 First there are the two fantastic 15 story oceanfront towers that Ocean Creek is famous for. You'll find one, two, and three-bedroom luxury condos with every amenity and views to die for. The condos include designer kitchens, top of the line appliances, and spacious rooms with private balconies and designer furnishings. Pools and spas compete with one of the most scenic parts of the beach and salt marsh you'll find anywhere. These are truly luxurious condominiums and the perfect vacation home with excellent rental income possibilities. Another section of Ocean Creek is called the Garden Homes. These are townhomes, attached but private, with patios, an elegant courtyard, and a natural, wooded setting. The homes have all sorts of luxury upgrades from vaulted ceilings, high-end appliances, and designer furnishings. The Lodge Villas are some of the most economical accommodations, with spacious one and two-bedroom condos that share a wrap-around porch and have the feel of a summer camp! Tennis lovers will enjoy Ocean Creek's Tennis Villas. These condos are one, two, or three bedroom units that are connected to the tennis courts, pool complex, and other waterpark attractions in the community. More "villa" than condo, the Tennis Villas have a private entry, screened-in porch, full-size kitchen, and washer/dryers in each unit. Lastly are The Greens townhomes. These are two and three bedroom split-level homes with a putting green as a front yard and a luxury pool area as the back yard. You can't get better than these homes in a non-oceanfront condo. - High-speed Internet Access, and much, much more! You must visit Ocean Creek and look at the available units for sale. This is a one-of-a-kind resort. Contact us for a tour and more information.